Rounding the blank - turning the tenon for the decorative band with a 1/16in parting tool. 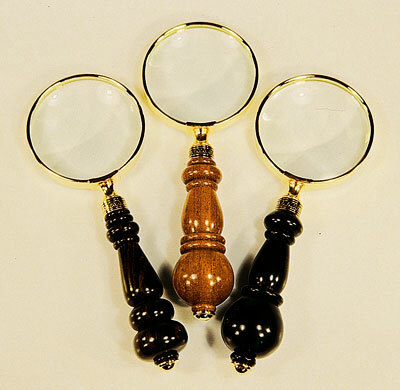 Letter openers and magnifying glasses are two of the more successful items in my studio's Premier Gifts line. They are turned between centres, on a mandrel similar to that for turning a pen. Both can be given graceful handles or be inlaid with precious-metal inlays, gemstones and other materials. You can use various-sized stock, but my slimline handles are usually turned from 19mm-25mm (3/4-1in) blanks, with larger and more robust styles from 32-38mm (1 1/4-1 1/2in.) I prefer the larger and more robust styles, which offer more options in the creative process of turning the handles. 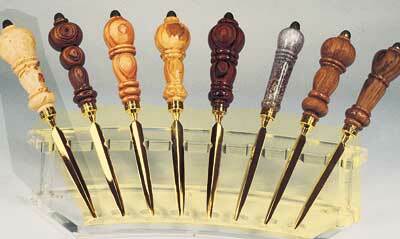 They also allow many more options when inlaying the handles with precious metals and gemstones. As I describe them as 'up-market' items, I only use highly-figured timbers, burrs and other special materials like antler, or horn for the handle bodies. Small crotch wood is good if local timber is used, as are tight fiddle back or curl areas. Burrs, too, are an excellent choice, and are very popular with buyers. Offcuts from bowl blanks and other scraps can also be used. Proper drilling procedures should be followed to ensure you get a well-centred, straight hole for the brass tube. Because many of the timbers we prefer to turn have wild grain, you must take care when drilling the blanks to prevent 'blow-outs,' or off-centre holes. Certain drill-bit designs are more prone to this, especially the sharply-pointed brad-point style. The newer blunt-pointed, or 'bullet-point' bits work well for drilling into potentially difficult timbers. They track very well through wild grain and produce clean and straight holes. Parabolic-style bits also work well, although I use bullet-pointed for most drilling. Many drilling jigs can be used to secure the handle blank for drilling; but, I prefer to use the X-Y type of drill vice. This allows the blank to be moved in both the X and Y axis and saves time when they are of slightly irregular size. I use a 'fluid-pulsed' technique to drill the holes quickly and efficiently. This technique uses an occasional shot of compressed air to clean the drill flutes and cool the bit. Some exotics are fairly sensitive to heat build-up, and you must regularly clear the drill-bit flutes to prevent seizing, or heat-related checking inside the drilled hole. 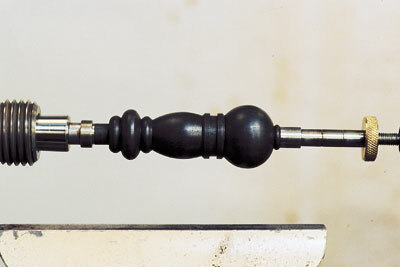 The fluid-pulsed technique uses an up and down pulsed action to drill the hole and clear the flutes. This technique is a modification of my high-speed drilling protocol and is more suitable for non-production drilling requirements. The blank must be securely fastened for drilling. With the blank centre clearly marked, turn on the drill press and advance the bit until it enters the top of the timber. As you advance the tool slightly, withdraw the bit and re-advance the drill bit in a fluid-pulsed, or (in-out) movement. The first few millimetres of drilling are critical to ensure a straight and clean hole. Once the bit has penetrated the blank 10mm (3/4in), you can increase your pulsed drilling motion, using a faster and deeper plunge stroke. Depending on the species, you may have to stop and use a short blast of air to cool the bit and clean the sticky debris from the flutes. Some rosewood species (such as Madagascar rosewood) are particularly bad about gumming-up up the flutes during drilling. As you continue your fluid-pulsed drilling, you need to slow down and reduce your penetration speed when you near the bottom of the blank. This prevents torn grain on the bottom of the blank, when the bit exits the timber. Upon completion of the drilling, remove the blank from the vice and give a short blast of cool air down the drilled hole, to cool the inner walls. Another quick blast to the tip of the drill bit and you are ready to drill another blank. I usually process these blanks in batches of 25-50, which saves valuable set-up time and increases the efficiency of the process. With drilling completed, the next step is to glue the brass tubes into the drilled holes. Take some 320-grit sandpaper and scuff up the outside of the brass tube. This removes residual tarnish on the tube and creates small scratches for the adhesive to bond to. them with the lathe set to a low speed to speed up the process. If the handle blank is an oily exotic timber, you may wish to swab the hole with Acetone, or another similar solvent, to remove any residual oils that may interfere with the adhesive bond. When the solvent has dried, you can glue the tube in place.Several types of adhesives can be used for this. If you like the 2-Cyanoacrylate type, use the thicker products for best results. I apply three thin lines of a thick-bodied CA glue equidistantly around the exterior of the tube.Gently insert the tube into the drilled hole in a spinning and pumping motion. This will evenly distribute the CA on the inner walls of the drilled hole and help ensure a uniform application of the adhesive. Some exotic timbers contain natural extractives that act as accelerators for CA glues. This can sometimes cause the CA glue to bond prematurely, before you have fully inserted the tube into the drilled hole. Using the thicker CA's helps to counteract this problem, as does a pre-emptive solvent wash of the hole. Another good choice for gluing-in the tubes are Poly-glues. These will work on oily exotics, and give a generous setting time in which to insert and spin the tubes. They are moisture-cured and take a few hours to bond before you can turn the blanks. Poly-glues will foam out of the hole and fill the mating areas between the tube and the blank. This produces an excellent bond, but it takes much longer to cure than a thick CA type of glue. In my studio, I often glue the tubes one day and turn them the next. If I need to turn one faster than the Poly- glue can set-up, I use the thick, faster-setting CAs. When the adhesive has cured, you must square the ends of the blanks to the tubes. This can be done by sanding the end flush and straight on a sanding station, or by using a special tool called a 'barrel trimmer.' These are the best tools to use, because as well as squaring the end of the blank and the tube, the inner cutter also cleans the interior of the tube of any excess glue. Barrel trimmers should be used only with the blank secured in a vice, or other secure fitting. Don't try to hold it in your hand! 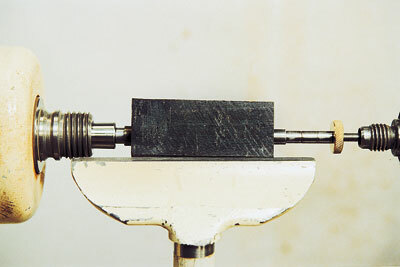 A drill press with an X-Y vice can be used or, a hand drill and a small wood vice. With the blank secured, insert the proper-size barrel trimmer into the tube and start the drill. If you cut your blanks accurately, there will only be a millimetre or two of excess timber on each end of the tube. The barrel trimmer will quickly remove this waste and square the end of the brass tube. When you see the bright brass of the tube revealed, stop and repeat the process on the opposite end of the blank. You should have a uniformly-flat area around the tube, and the brass end should be uniformly bright. If there is a small area that is not bright, use the barrel trimmer again to flatten and true the end of the blank until the end of the brass tube is uniformly bright. 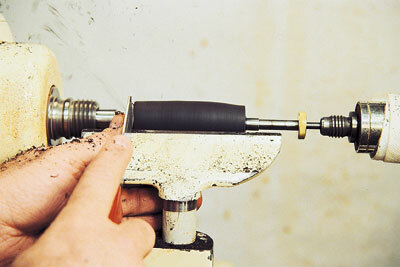 Before mounting the blank on the mandrel, make sure your lathe's Morse taper is clean and free of debris. A special Morse-taper cleaner (Taper Mate) can be used to quickly clean the interior. Once the Morse taper is clean, securely insert the mandrel into the taper. 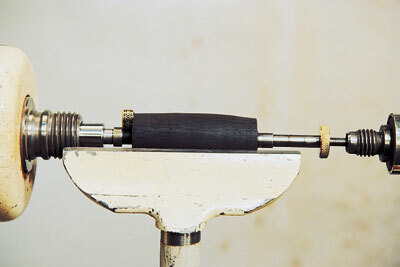 If your spindle locks, do so, and try to turn the exposed mandrel taper end to check if it is seated correctly. The opposite end of the mandrel contains a dimple to accommodate the point of a revolving centre from the tailstock. Ensure the mandrel's dimpled end is also clean and free of debris. The point of your revolving centre must also be clean and in good condition. If the point is damaged, consider replacing it or dedicating a special point or revolving centre for mandrel work. Use a short blast of compressed air to clear the interior of the blank tube and the mandrel shaft, before mounting the blank on the mandrel. Any debris left in the tube or on the mandrel can affect the performance and accuracy of the latter. There will be two bushings for your letter opener/magnifier handle. Install the first on the mandrel, then the blank, followed by the second bushing. Depending on the length and style of the mandrel, you may have to use spacers to allow the end nut to tighten the blank and bushings. You can use other bushings that you may have, or take some spare brass tubes and turn a few short pieces of scrap timber of different lengths to use for your various projects. I don't cut the corners on my blanks before rounding them, as it's not cost-effective in a production environment. So I must pay particular attention to how I round them. The mandrel can become bent, or inaccurate from a too-aggressive rounding-over technique - especially true with the longer double mandrels. When you mount the blank, the tightness of the nut on the mandrel and the amount of tailstock pressure you apply is CRITICAL. Newer mandrels have a brass nut you can tighten by hand. This is far superior to the old style mandrels that need a wrench to tighten. Use just enough pressure on the knurled brass nut to prevent the blank spinning freely on the shaft. When you bring up the tailstock, advance it near the end of the mandrel and tighten. Don't 'bang' the tailstock into the end of the mandrel when you are moving it up, as this can bend the shaft, making the mandrel useless for precision work. Advance the tailstock's revolving centre into close contact with the mandrel dimple, using the tailstock's handwheel. if you apply too much force. 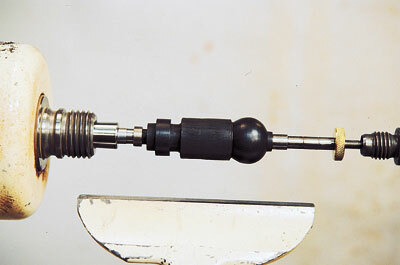 Bring the cone centre into the mating dimple/cone on the mandrel shaft until it just touches the mandrel. Then, turn on the lathe and advance it the last few millimetres, causing the revolving centre to begin turning. This requires the right 'touch,' which you will have to learn. It's easy to apply too much force and bow the mandrel. This will cause you to turn an ellipse and your project parts will not fit correctly. As you round the blank, you may tend to push the tool into it, causing the mandrel to bow or flex. You must be spot on with your technique here. I prefer to turn this type of project at 3,000 - 3,950 rpm from start to finish, including sanding and finishing. It creates a more elegant, but smaller, cut that rounds the blank quickly. Never put the tool straight into the mandrel when rounding it; always cut at an angle towards the headstock, or tailstock end. To round the blank, I use a 3/8in (10mm) spindle gouge (with fingernail grind), or a 1in (25mm) skew chisel. After rounding the blank, stop the lathe and RE-ADJUST the tension on the retaining nut, as the rounding over process makes it tighten a lot. Too much tension on this nut can make the mandrel bow. 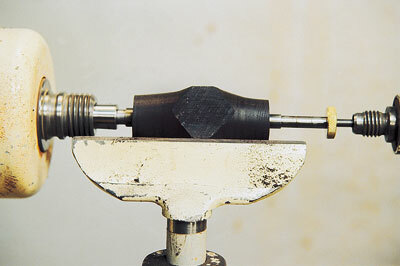 After you have rounded the blank, very little pressure is needed to keep the blank from spinning on the mandrel shaft. This helps extend the life of the mandrel and ensures you produce the most accurate projects possible. With the blank rounded, stop the lathe and examine the blank for defects. Decide which end will receive the decorative band and restart the lathe. Using a small parting tool, turn and form the tenon for the decorative band. This band will contain free-moving bushing, which can be used to size the tenon shaft correctly. However, most of the decorative bushings are longer than the free-moving bushing, so you must manually check for proper fitting of the band. When the tenon for the decorative band has been sized, turn your attention to the opposite side of the blank, and start turning the area that will mate with the end cap. I like to use a small bead here, which is turned with a 3mm (1/8in) or 5mm (3/16in) micro spindle gouge and refined with a 6mm (1/4in) skew chisel. Once these areas are sized, you are ready to turn the main body part of the handle. Since this will be held by the user, turn easy-to-hold designs which fit the hand comfortably. I like to turn handles that taper from the larger cap end to the smaller decorative band, where the letter opener blade, or magnifying glass will be installed. To turn the main body part, I use micro turning tools, including the 1/4in (6mm), 1/8in (3mm) and 3/16in (5mm) spindle gouges. Bead details are refined with a 1/4in skew chisel, with the long point leading the cut. Don't include details with sharp or acute angles, as the uncomfortable grip may deter prospective buyers. Also, sharp or thin edges will not stand up to bumping about in desk drawers and may chip out. "Do not include details with sharp or acute angles, as the uncomfortable grip may deter prospective buyers"